ajmer is one of the most sacred places in India. The history of ajmer dates back to the 7th century when it was established as by Ajaipal Chauhan. It is a city rich in history. Surrounded by the Aravali hills it lies 130 kilometers west of Jaipur. 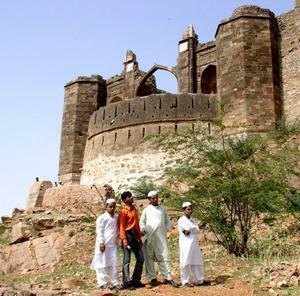 It was always the stronghold of the Chauhan Rajputs. They claimed that they were the descendants of the Agni kula. ajmer was with them till the 12th century. ajmer was established in the early seventh centuary by Ajaipal Chauhan. Ajaipal chauhan constructed a tall fort here and named the place Ajaimeru, or invincible hill , because here he built India,s first hill fort Taragah. ajmer was a chauhan Stronghold till 1194. The Only remains of their times are the fort and the beautiful Anasagar lake built in 1150 by Anaji. The legendry Prithviraj, last of the Chauhans, is the inspiration for many heroic ballads sung even today in the vilages of Rajasthan. It was during the reign of Prithviraj, in 1191, that Muhammad of Ghori invaded India. Prithviraj died fighting the sultan's army, and with the establishment of the Sultanate in Delhi, a new era began.